You can purchase LoRad 1.5 in standard pre-terminated lengths of 1m, 1.5m, 2m or 4m fitted with (in UK) a 13 Amp fused plug and an IEC line socket (other lengths are available to order). 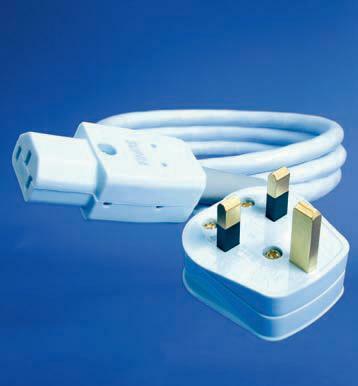 The UK version is called "CS-BS" meaning "cord-set, British Standard" - at present only LoRad 1.5 is available in UK in a factory terminated form, fitted with a UK 13 Amp plug and a standard IEC connector. (Note: Due to current British Standards regulations, any mains cables using conductors of greater than 1.5 sq mm are NOT LEGAL as a pre-terminated cable for domestic use - hence LoRad 2.5 is NOT available with factory-fitted UK connectors - however Schuko terminated versions are available in EC). LoRad comes in two form factors with conductors - either as LoRad 1.5 (with 1.5 sq. mm conductors) or LoRad 2.5 (with 2.5 sq. mm conductors). Both can be bought "off the reel" along with matching Supra 13 Amp plugs and IEC connectors. Buying "off the reel", allows you to make up custom length versions for your own particular system or listening room.